Michelle Grabner, Mark Mothersbaugh, and Jerry Saltz will join the weeklong event-within-an-event featuring amplified conversations on the intersection of art, design, technology, urbanism, and identity at ArtPrize Eight—including a conversation with the Grand Prize Jurors. GRAND RAPIDS, Michigan (AUGUST 25, 2016) -- ArtPrize, the radically open international art competition decided equally by public vote and expert jury, today announced the Critical Discourse lineup—powered by ITC, Your Energy Superhighway—that will bring together experts in the fields of art, design, and technology at the eighth annual event. The weeklong event-within-an-event, which expanded in 2016 to include a year-round online video series, is free and open to the public, running from September 25 to October 4, 2016. Critical Discourse will once again transform the ArtPrize HUB/HQ theater into a TV studio dubbed the Critical Discourse Studio, and ArtPrize-goers are invited to be part of the live audience, taking part in six evenings of exploration, interpretation, debate, public opinion, and expert critique. This unpredictable, inspiring, and occasionally irreverent series will include fan favorites: the Jurors’ Shortlist announcement, as well as the two-part Why These Finalists? event; all three will be broadcast live on NBC affiliate WOOD TV8. The 2016 Critical Discourse series will kick off on September 25 with Liverpool Biennial: Learning from the City, presented in collaboration with Independent Curators International’s Curator’s Perspective lecture series. Sally Tallant, Director of Liverpool Biennial, will present a long-term approach to making art and Biennials in situ. The Biennial, presenting its 9th edition in 2016, explores fictions, stories, and histories—taking viewers on a series of voyages through time and space, drawing on Liverpool’s past, present and future. Projects from dozens of artists are sited in galleries, public spaces, unused buildings, live performances, and online. 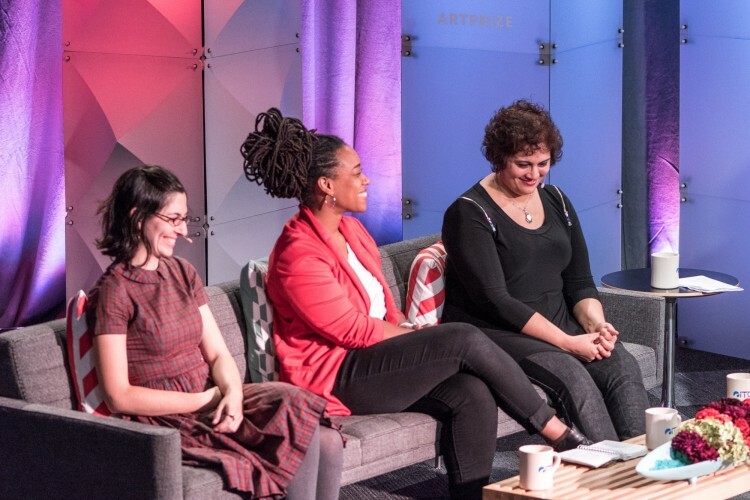 On September 26, the ArtPrize Eight Category Award Jurors will present and discuss their Top 20 picks at the Jurors’ Shortlist Event, broadcast live on WOOD TV8. Artists submitted 1,453 entries into one of four categories including 2-D, 3-D, Time-Based, and Installation. A fifth category award will be given to an ArtPrize Venue for outstanding curatorial presentation. During the Jurors’ Shortlist Event, category award jurors—each experts in their given categories—will offer unique perspectives on the landscape of ArtPrize Eight entries. Though well-known around the globe as a founding member of the popular band DEVO, Mark Mothersbaugh has been a prolific artist since before the band’s inception. To this day, he continues to add to this massive body of work, which includes prints, drawings, paintings, sculptures, rugs, musical instruments, videos, and performances. His unique artistic view constantly foregrounds the relationship between technology and individuality. On September 28, Mark Mothersbaugh’s Myopia—presented in collaboration with The University of Michigan’s Penny Stamps Lecture Series—will explore his life and work, which form the subject matter of the major book and traveling museum retrospective titled Myopia. Mothersbaugh will be joined on the Critical Discourse stage by Adam Lerner, author of the book, curator of a retrospective exhibition and catalogue of Mothersbaugh's work, and Director of the Museum of Contemporary Art Denver. The ArtPrize Eight Grand Prize Jurors—including Michelle Grabner, artist and professor at School of the Art Institute of Chicago; Paul Ha, Director at the MIT List Visual Arts Center; and Eric Shiner, Senior Vice President at Sotheby’s—will take the Critical Discourse stage on the evening of September 29. Their discussion will revolve around the current and future state of contemporary art exhibitions. Critical Discourse programming will culminate with the two-part series Why These Finalists?. On October 3 and 4, a panel of three art experts will discuss half of the public and juried finalists in a lively, humorous, and irreverent debate—further exploring the tension between public and expert approaches to assessing art, and seek to answer the burning question often asked on each side of the debate. Both nights will be broadcast live on WOOD TV8. On the evening of October 3, Chad Alligood, curator at Crystal Bridges Museum of American Art; Kristin Fleischmann, Director of Public Projects at Pulitzer Arts Foundation; and Jerry Saltz, Senior Art Critic for New York Magazine will discuss the 2-D and Installation finalists. "ArtPrize is the most open, optimistic, and inspiring opportunity for artists that I know of,” said Saltz. “I can't wait to be a part of it again this year! Artists start your engines." And on October 4, Alice Gray Stites, Chief Curator at 21c Museum Hotels; Neil Barclay, Director of the Contemporary Arts Center of New Orleans; and Gregory Volk, art critic based in New York will examine finalist entries in the 3-D and Time-Based categories. New in 2016, ArtPrize has expanded its popular "Critical Discourse" program to include a year-round online video series -- continuing the charged conversation around the topics of contemporary and public art, freedom of expression, mass collaboration, crowdsourcing, urban engagement, and of course ArtPrize, beyond the 19-day event. To watch the series, visit artprize.org/cd and follow the ArtPrize Critical Discourse YouTube channel.